Personalized Immunosuppression in Transplantation: Role of Biomarker Monitoring and Therapeutic Drug Monitoring provides coverage of the various approaches to monitoring immunosuppressants in transplant patients, including the most recently developed biomarker monitoring methods, pharmacogenomics approaches, and traditional therapeutic drug monitoring. The book is written for pathologists, toxicologists, and transplant surgeons who are involved in the management of transplant patients, offering them in-depth coverage of the management of immunosuppressant therapy in transplant patients with the goal of maximum benefit from drug therapy and minimal risk of drug toxicity. 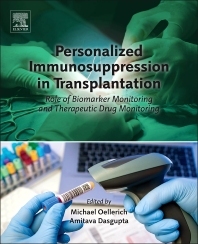 This book also provides practical guidelines for managing immunosuppressant therapy, including the therapeutic ranges of various immunosuppressants, the pitfalls of methodologies used for determination of these immunosuppressants in whole blood or plasma, appropriate pharmacogenomics testing for organ transplant recipients, and when biomarker monitoring could be helpful. Pathologists, clinical chemists, toxicologists, and transplant surgeons who are involved in the routine care of transplant patients; transplant nephrologists, gastroenterologists, cardiologists, pulmonary physicians and fellows in transplantation program and supervisors of toxicology or immunosuppressant monitoring laboratories. 2.3 Cyclosporine Monitoring: Trough or C2 Monitoring? Chapter 4. Monitoring free mycophenolic acid concentration: Is there any clinical advantage? Michael Oellerich, MD, HonMD, FACB, FAMM, FFPath (RCPI), FRCPath, is a chemical pathologist. Since 2012, he has had an appointment as a Lower Saxony Distinguished Professor of Clinical Chemistry at the Department of Clinical Pharmacology, Medical Faculty (UMG) of the George-August University, Göttingen, Germany. He was Chairman of the Department of Clinical Chemistry/Central Laboratory at UMG from 1991 to 2012. Since 2013, he has been a member of the Medical Advisory Board of Chronix Biomedical Inc., San Jose, CA, USA. From 1996 to 1998, he served as Dean of the Faculty of Medicine. He also served as President of the International Association of Therapeutic Drug Monitoring and Clinical Toxicology (IATDMCT), the German Association for Laboratory Medicine, the German United Association for Clinical Chemistry and Laboratory Medicine, and the World Association of Societies of Pathology and Laboratory (WASPaLM). Since 2003, he has been Editor-in-Chief of Therapeutic Drug Monitoring. Previously, he was Associate Editor of Clinical Biochemistry and of Clinical Chemistry. His current research interests are in the field of therapeutic drug monitoring, with particular focus on endogenous biomarkers to achieve personalized immunosuppression in transplantation (e.g. graft-derived circulating cell-free DNA as “liquid biopsy”), as well as pharmacogenetics. Further topics include proteomics, analytical techniques (e.g. LC-MS/MS), and molecular diagnostics. He has authored more than 400 publications, and has received various awards (e.g. Ludolf-Krehl Award, IATDMCT Charles Pippenger Award, WASPaLM Medal of Honor, WASPaLM Gold-Headed Cane). Amitava Dasgupta received his PhD degree in Chemistry from Stanford University and his fellowship training in Clinical Chemistry from the Laboratory Medicine Department of the University of Washington School of Medicine at Seattle. He is a tenured Full Professor of Pathology and Laboratory Medicine at the University of Texas Health Sciences Center located at the Texas Medical Center at Houston. Dr. Dasgupta has published 210 scientific papers, written many invited review articles, and has edited, co-edited or written 15 books. He is on the Editorial Board of five major medical journals including American Journal of Clinical Pathology, Archives of Pathology and Laboratory Medicine, Therapeutic Drug Monitoring, Clinica Chimica Acta and Journal of Clinical Laboratory Analysis.